“Better Late than Never” from Christian Faith Publishing author Janice L. Nichols is an inspiring book filled with encouragement, faith, hope, and compassion for those who believe in God but are tired of waking up frustrated every day or feel the Spirit urging them forward but are not sure where to start. Nichols provides guidance with this engaging handbook for methodical spiritual improvement on the path to bringing glory to God. “Better Late Than Never”: an uplifting manual for living a more godly and fulfilled life. “Better Late Than Never” is the creation of published author Janice L. Nichols, an award-winning real estate professional and executive director of Oconee River Greenway Authority, as well as a certified master catechist and active member of Prince of Peace Catholic Church. Published by Christian Faith Publishing, Janice L. Nichols’s new book is a wonderful reminder from the Spirit. Nichols writes in the voice of an encouraging apostle to the wary and weary sheep of Christ. “Better Late Than Never” provides instructional and thought-provoking messages as well as reflections to jump-start the spiritual growth of even those who feel they are on the fast track to God. View a synopsis of “Better Late Than Never” on YouTube. Consumers can purchase “Better Late Than Never” at traditional brick & mortar bookstores, or online at Amazon.com, Apple iTunes store, or Barnes and Noble. 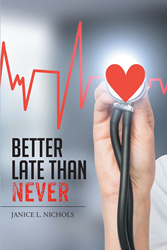 For additional information or inquiries about “Better Late Than Never”, contact the Christian Faith Publishing media department at 866-554-0919.